The SB12-NSD is no longer in stock. For comparable performance, check out the SVS SB-1000 and SB-2000 subwoofers or browse the SVS Outlet store for the best prices you’ll find on all SVS subwoofers. If you’re looking for an absolute steal of a subwoofer deal, the SB12-NSD is a well-balanced powerhouse that blends with any speakers to provide the perfect foundation of low-frequency output. Best of all, it’s available for only $399.99, nearly 50% off the original price of $680! Equally adaptable for music, movies, TV and gaming, in any room, the SB12-NSD produces deep, tight and articulate bass at any drive level with pinpoint accuracy and transient speed. With this low price, room-friendly design and limited supply, these subwoofers will disappear fast. With SVS, compact and affordable doesn’t mean compromising on performance. The 12” driver in the SB12-NSD handles every watt of the Sledge amplifier’s power and pumps out loads of deep, flawless and powerful bass with ultra-low distortion, even when pushed to the absolute limit. The SB12-NSD is available in premium Black Ash finish for high end styling that complements its stunning performance. At just over 14” on all sides, the compact SB12-NSD is incredibly easy to integrate into any living space and can even be placed inside furniture for a totally discrete set-up. The sealed box cabinet is optimized for deep, room-energizing bass, lightning quick speed in transients and revealing musicality that will suit both audiophiles and hone theater fans alike. "Overall, the SB12-NSD is a talented bass beast that marries impressive weight with control and finesse… the SVS boasts excellent low-end extension and ferocity – but is also fast, detailed and extremely accurate." "At the end of our term with the SB12-NSD we came away impressed with the overall build quality, look and behavior of this small sealed unit. Highly Recommended." "...after spending a few weeks getting intimately acquainted with the review unit provided by SVS, we found very little to gripe about and a whole lot to like." "Diminutive form factor + light weight allows plenty of placement options" "Impeccable design execution and optimization"
"Build and operation is smooth and apparently bomb proof, the finishes you're allowed are superb, it's looks distinctive without being overly extrovert." ... but ultimately it's the performance level achieved that sets the SVS SB12-NSD apart." "... you can't go lower, louder, as cleanly as well as doing it all in such a musical fashion, with such impact, in such a small box." Enthusiast forums in the US have been just effusive of the newest SB12-NSD's. Home Theater Shack has long been a hotbed of SVS advice and fans but few know our products better than Dennis Doan. Accomplished musician and Doctor, Dennis knows a clean acoustical sound when he hears it! Both our S-Series speakers and the SB12-NSD got praise in this piece! "This small sub is truly a giant killer." "... incredible definition." "...this little bugger will hold its own right to the level of wall destruction." “...this little bugger will hold its own right to the level of wall destruction." The PB12-NSD subwoofer is the ultimate subwoofer over-achiever. It’s room-energizing, pants-flapping bass, for a fraction of the cost of the typical reference subwoofer. SPLs and output also compares with much larger ported box subwoofers but with a greater control and accuracy from the sophisticated Sledge amplifier, overbuilt driver and precisely tuned cabinet. 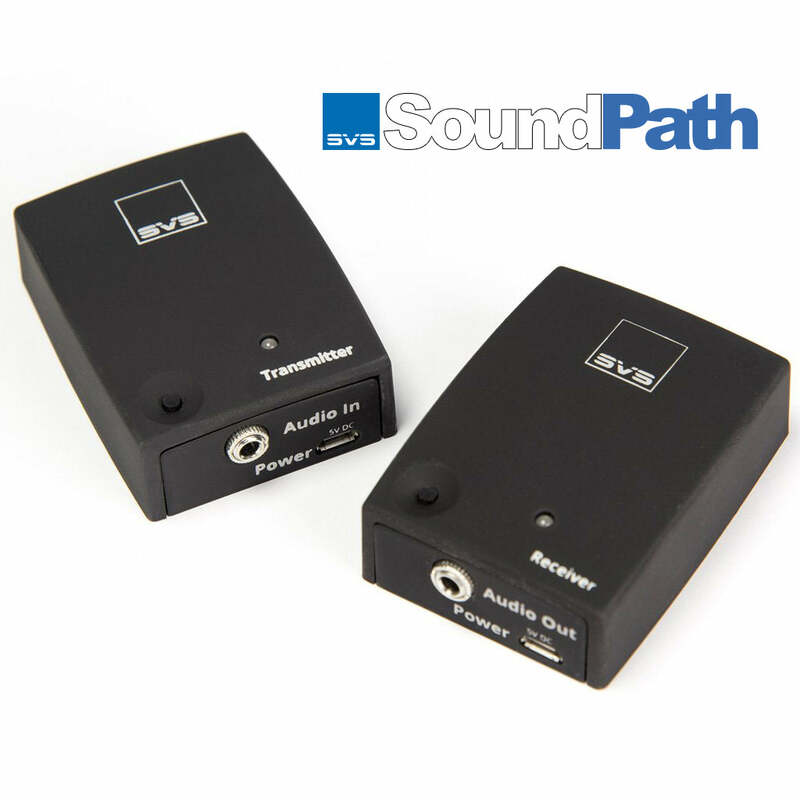 SVS SoundPath Wireless Audio Adapter is a high performance wireless transmitter and receiver kit for subwoofers, amplifiers, surround speakers and second zone powered speakers. The above products are often considered when someone is evaluating the SB12-NSD.